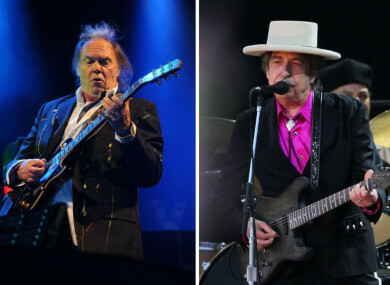 ICONIC MUSICIANS BOB Dylan and Neil Young will play in Co Kilkenny next year. The concert will happen on 14 July at Nowlan Park Kilkenny. Tickets will be priced from €76, and go on sale on Monday at 9am. The two are also to headline the British Summer Time festival in Hyde Park along with Robbie Williams next year as part of an open-air show. “I suggested would they like to come to Ireland [afterwards], to come to Kilkenny, and we’ve been talking about it for the past 6 months,” said Peter Aiken on RTÉ’s Morning Ireland show this morning. Legendary American singer-songwriter Dylan has been a music and culture icon, since emerging in the New York folk scene in the 1960s. In 2016, he was awarded the Nobel Prize in Literature “for having created new poetic expressions within the great American song tradition”. Young, the iconic Canadian rock and folk musician, is famed for his distinctive voice and personal lyrics. He’s been nominated for a number of Grammy awards, and has won three. Email “Bob Dylan and Neil Young to play together in Kilkenny next July”. Feedback on “Bob Dylan and Neil Young to play together in Kilkenny next July”.